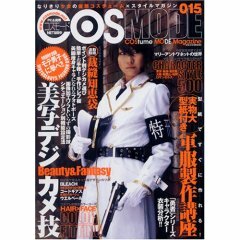 COSMODE is loaded with photographs of Japanese cosplayers at cosplay events, cosplay models, the latest news, tips for make-up and creating your own costumes, data of cosplay related companies and shops, event info, introduction to characters and more. If you are into cosplay, COSMODE is indispensable. Published by Eichi Publishing, which also publishes, among others, 411, CHOPPER MAGAZINE, Beppin School, Bejean and Suppin EVOLUTION.